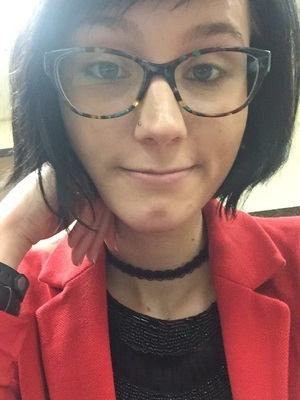 Elizabeth Miller, a PhD student of English emphasizing in rhetoric, composition and literacy, is also working toward a graduate interdisciplinary specialization in disability studies. Research interests include feminist and queer rhetorics and methodologies, Victorian culture and the interplay between discourses constituting publics and those constituting marginalized counterpublics. Specifically, Miller is intrigued by the ways that minds and bodies move through public spaces, now and at various historical moments, and wishes to draw attention to diverse ways of being, dwelling, participating and/or subverting. This, ideally, will translate into the construction of accessible classroom pedagogies as well as caring and sustainable life practices more generally. A current project Miller is working on involves an analysis of the rhetoric of female journalists operating during the latter half of the nineteenth-century in Victorian England and specifically addresses the implications of assigning feminist (or otherwise) identities to people far removed from our own cultural climate(s). A section of this project was recently presented at the Conference on College Composition and Communication. "Sanctioned Social Evil: Textual Exploitation of the Prostitute in Victorian Discourse." The Sigma Tau Delta Review, vol. 12, pp. 56-64, 2015.